Every year hundreds of people climb Silbury Hill, ignoring signs explaining why they should not. 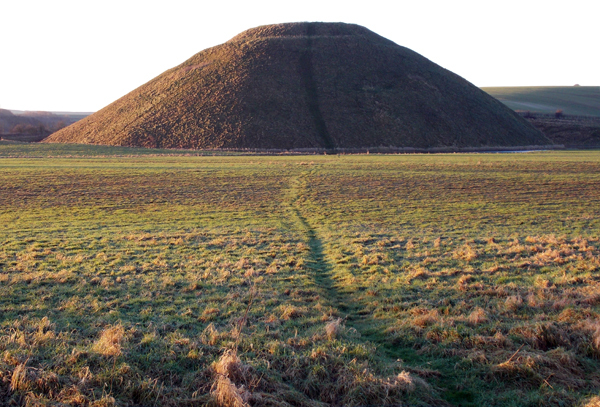 Until recently, all used an ancient spiral path that is conspicuously visible from the roadside, but after Silbury’s 2008 restoration at least half a dozen new routes appeared, each producing an ugly, vertical scar. Most climbers preferred the same ‘discrete’ route least visible from the road; after only a few years their collective boots formed steps, as they cut through the turf into bare soil. In this record year of rainfall that soil has eroded away, leaving a foot-deep scar. Those that climb assume that one individual cannot make any difference to a monument so vast – but there are people on the hill virtually every day of the year. Hundreds of individuals do make a difference, as this picture clearly shows: crossing the meadow then up the side of the monument, the climbers are eroding irreplaceable archaeology that has stood for thousands of years. As it originally had a ramped path forming a polygonal ascent, maybe that’s what should be restored? View Sillbury Hill from West Kennet Long Barrow!